With its flexible architecture and popular shipping methods, Magento 1.x has been the lifeblood of many e-Commerce businesses over the past few years. Therefore, after the release of Magento 2.0, some retailers are confused about migrating their e-Commerce website from Magento 1 along with the different features and functions that it offers. Magento 2 empowers businesses to deliver engaging omni-channeled shopping experiences to their customers in a quick and cost-effective way. It also includes various features that help in boosting conversion rates, business scalability and performance. No new features in Magento 1.x: Since the entire action revolves around Magento 2.0, Magento 1.x versions haven’t received any updates or new features lately. Only bug fixes and security patches are being addressed. However, the support for Magento enterprise versions 1.13 and 1.14 is likely to continue till 2019 considering the 1.5 year window that Magento talked about for its customers. Read the announcement here. More focus on Magento 2: Since the developers working on third-party extensions are intensely focused on Magento 2, the Magento 1 extensions are expected to become obsolete over the next couple of years. This means you should start planning your Magento 2 upgrade soon. Being relatively faster than its older 1.x versions, Magento Enterprise Edition 2.0 supports a feature named, Split Database Solution which helps your administrator in setting up different databases for the checkout process, product catalog, and order management. With the absence of table locks, the chances of failure caused due to a database will decrease to a large extent. Magento has worked to achieve better efficiency and innovation at managing e-Commerce operations, read more about their improvements, here. Responsive themes are one of the biggest benefits that Magento 2.0 provides as it makes your e-Commerce website a perfect fit over a phone or tablet. Unless you’ve been using Magento Enterprise Edition 1.14, Community Edition 1.9, or a custom third-party theme, your e-Commerce website cannot become responsive and that’s really shocking. With approximately 50 percent of e-Commerce traffic coming from mobile devices, it has become necessary for a store to allow its customers to navigate, shop, and order from a phone/tablet. You are going to miss out on potential sales if your website is not responsive. Magento 2.0 leverages an extension called Varnish Cache which helps to speed up the process of page loading in both the enterprise and the community editions. In today’s competitive e-Commerce environment, customers have many options and they will leave if your site’s page loading speed is not optimum; that is under 3 seconds. So, the addition of Varnish is considered as a crucial aspect in terms of delivering as per the shopper’s expectations. In fact, a slower page loading time can lead to both, lower Google rankings and conversion rates. Thus, a slower page load speed can make you risk potential revenue opportunities. You can know more about page load speed comparisons, here. Magento 2.0 includes an installer that keeps all systems up-to-date. Also, it protects the store from various faulty codes, potential outside hacks or breaches and provides utmost security to the store. As per Magento, integration with payment gateways like PayPal, Braintree payments, and Authorize.net makes an e-Commerce site safe, secure, unbreachable, and pretty much PCI compliant. You can refer to the Magento 2 announcement for more clarity. 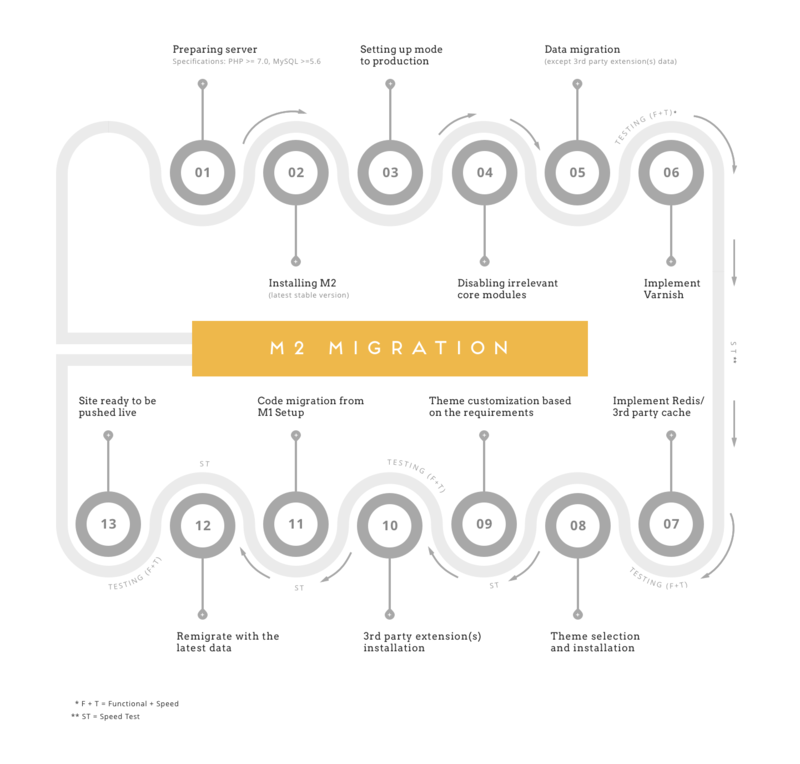 Confused about migrating to Magento 2? Looking for effective ways to upgrade your store? The infographic above will provide you an idea of the procedural flow for Magento 2 upgrade that we follow at CueBlocks. So, it’s high time to plan for your Magento 2.0 upgrade and if you still have any questions, then reach out to us at CueBlocks for consultation on performing your Magento 2.0 upgrade, the way it should be done!